Ever meet a treetrunk spider? During the last field season, Catherine and I went to the Nouragues reserve in French Guiana to do some work on army ants, as well as to tie up some loose ends of the caracara study. Because we wanted to determine the population density of these ants, we needed to walk several trail transects over the course of a few weeks. There are not many loop trails available near the Pararé camp, so we had to walk out to the start of our transect before we could begin. We aimed for a start time of 1:30 – 2 pm, so we often hiked out early so we could have a lunch at the transect start before beginning the return walk. Eciton burchellii, one of the ant species we were studying. On our first day walking the western transect, we were a bit early, so I decided to do some photography. I asked Catherine to look around for cool things to shoot, so we started off by examining the leaf litter. The Neotropical rainforest is absolutely loaded with spiders, many of them in the Ctenidae, or Wandering Spider family, which make great subjects. After shooting a couple spiders on the ground, I suggested Catherine have a look on the tree trunks, as I am familiar with the cryptic ways of some forest creatures (e.g. 1, 2). She quickly found a couple resting moths that she at first took for bracket fungi. The moths were great, but the encounter that was to be one of the highlights of our trip was when Catherine found this gorgeous and cryptic spider brooding her egg sac on a small trunk near the trail. My first instinct when shooting macro is to use a flash, but the falloff can be severe and ugly. The flash shows the detail quite well, but the character of the animal and the scene is altered entirely. Luckily we had a tripod, which is perfect for a still subject such as this, and allows natural lighting to convey the mood of the early afternoon forest. Here is the spider as seen on the trunk with a wide lens and natural light. At first we thought it was a Ctenid or Pisaurid because of the eye arrangement. Note the impressive camouflage of the egg sac. The female spider has obviously woven in bits of lichen and plant material to help the vulnerable egg sac blend in. Check out these ridiculously long spinnerets! This is definitely not a Ctenid or Pisaurid!. This is a Hersilliid, A.K.A. “Treetrunk Spider” or “Longtailed Spider”. They use these huge spinnerets in prey capture. 1) Neotropical spiders are abundant and diverse. Simple eye arrangement charts for North America may not work in South America! 2) Use the tripod wherever possible! The natural light is often beautiful, and much better than what a flash can provide. 3) Hersiliid spiders are awesome. In the future, we will make sure to try to observe them laying silk or capturing prey. UPDATE: Catherine has her own blog post about these awesome spiders here. Advanced composition tip: weevils add cuteness. This is one of my favourite images of this spider. 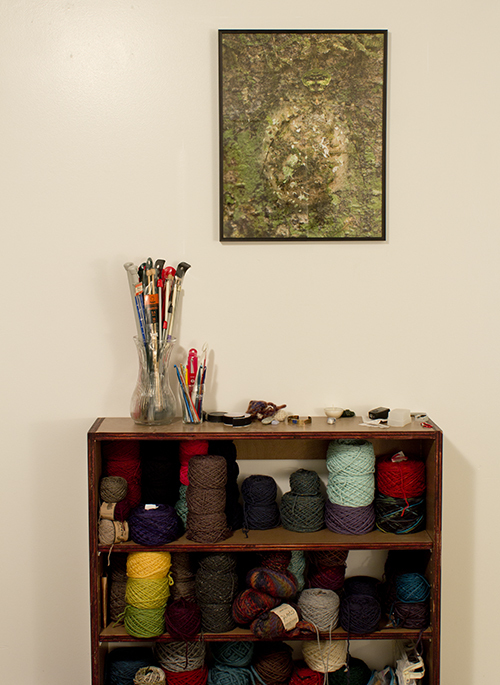 Now the treetrunk spider printed at 16″ X 20″ has pride of place over Catherine’s yarn collection. The Hersiliid spider is amazing! I envy your opportunities in the tropics! Thanks! This was certainly one of the most memorable spiders we have found. You should try to get to the tropics sometime!